Huntington Woods residents turn out to support popular "Drag Queen Storytime"
Huntington Woods City Commissioner Allison Iverson resigned abruptly on Tuesday, shortly after outraged voters learned she told an anti-gay group that she welcomed their help in trying to shut down "Drag Queen Storytime." The Huntington Woods Library program is just what it sounds like: a drag queen reading stories to kids. It's extremely popular, drawing such large attendance since it launched last year that it had to be moved from the library to a larger venue. Parents and other City Comissioners say it teaches kids at an early age to embrace diversity. At Tuesday's City Council meeting, Iverson's fellow commissioners unanimously voted to accept her resignation, to applause from the crowd. Public comments were overwhelmingly supportive of the library and the storytime. Raven Turner is the hostess for Drag Queen Storytime. She says it's an honor to have a chance to make a difference in young people's lives. "I was honored to meet a nine-year old trans girl who had never met anyone like her," Turner said. "It was tears in her mother's eyes and it wasn't of sorrow, it was of joy. Because she had finally found someone like her daughter for her daughter. So this program is a great thing. It teaches acceptance, diversity, and education, and I'm glad to be a part of it, and I would never stop being a part of it." Azriel Apap is a senior at Berkley High. He says he came out as a trans boy at age 13. "I wonder if it would have been easier, if, when I was younger, I had an opportunity to attend something like Drag Queen Storytime," he said. "When I came out, I was so scared, I was so depressed. I was admitted to a hospital for being suicidal. I wonder if I could have realized sooner, if I could have had more of my childhood to be myself." 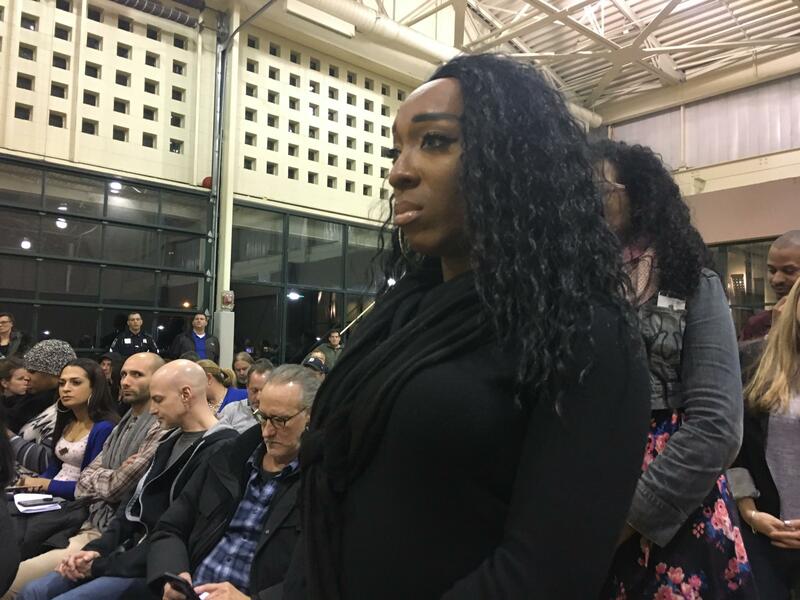 Four people at the meeting spoke out against Drag Queen Storytime, but only one was a city resident. One man said he was a Stockbridge resident and a friend of MassResistance, the anti-gay group contacted by Iverson. His remarks about the dangers to children from "sexual ideologues" drew angry protests from some in the crowd. Angie Povilaitis lives in Huntington Woods. She's also the former Assistant Attorney General who prosecuted sexual predator Larry Nassar. She says the people involved in anti-gay groups like MassResistance are spreading falsehoods. "I can tell you with complete conviction, our kids are in more danger with priests, or world-renowned Olympics gymnastics doctors - predators that I have put in prison - than at a library program such as the Drag Queen Storytime," she said. "The idea that children exposed to other ways of life are somehow at danger or at risk for sexual victimization is completely and utterly false." MassResistance claims on its website it will protest the next Drag Queen Storytime in January. City Commissioners said they'll wait out the controversy. They say Drag Queen Storytime will continue.